a single-chip processor with integrated transform, lighting, triangle setup/clipping, & rendering engines that is capable of processing a minimum of 10 million polygons per second. 2000 World's first GPU for notebook computers is introduced, the NVIDIA GeForce2 Go. 2002 NVIDIA named fastest growing company in the U.S. 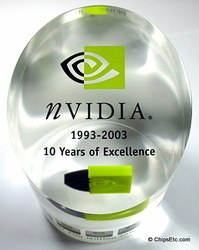 This NVIDIA Lucite anniversary paperweight was created to celebrate their highly successful video accelerator chips and GPU's that they have shipped during NVIDIA's first 10 years. 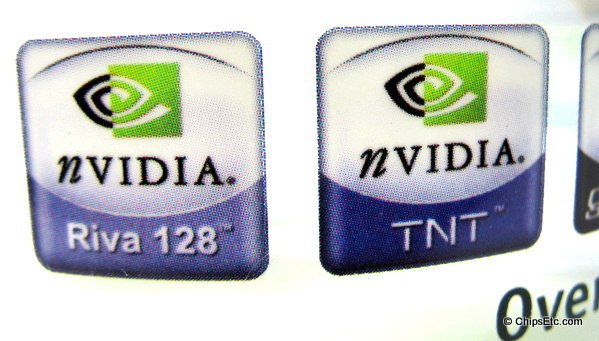 Taiwan Semiconductor (TSMC) has been NVIDIA's primary chip manufacturing foundry since they formed a partnership together in 1998, manufacturing NVIDIA's numerous GPU technologies. On the front of the paperweight it reads "1993-2003. 10 years of Excellence" and "Over 200 million shipped". 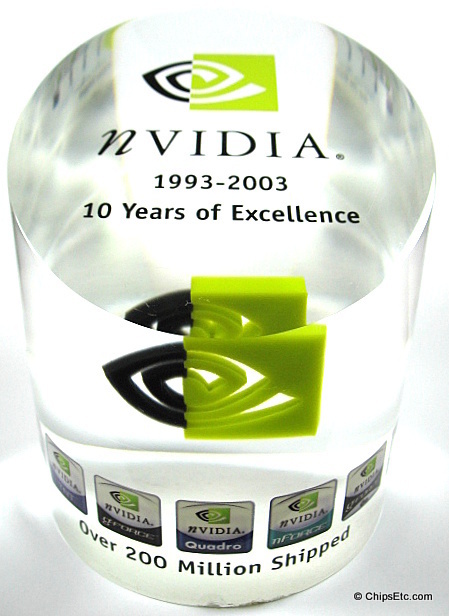 There is a 3D version of the NVIDIA logo embedded in the center of the paperweight. Measures 3-3/4" wide x 4-3/4" tall. 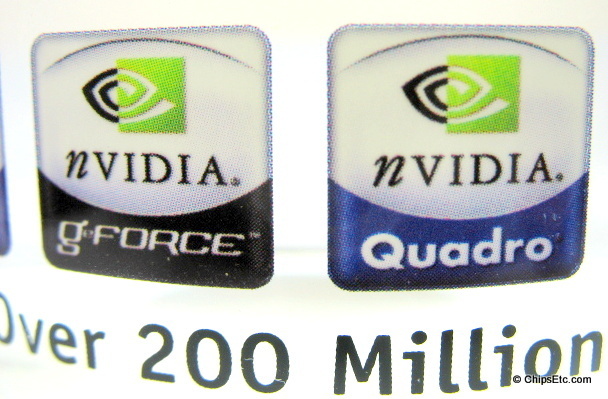 NVIDIA is a Fab-Less Semiconductor design company that contracts manufacturing of it's GPU processors to Taiwan Semiconductor Manufacturing Co., Ltd. (TSMC). 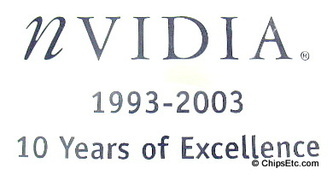 NVIDIA and TSMC began high-volume production in 1998 when NVIDIA was developing processors on 0.35 micron technology. Today, NVIDIA leverages TSMC's process technology leadership and is producing processors in state-of-the-art 300mm wafer fabs. 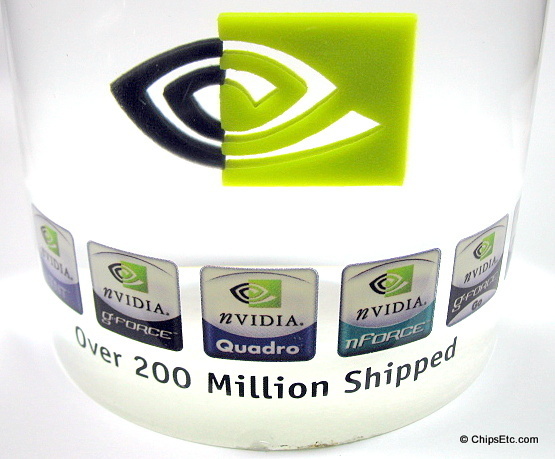 This is an NVIDIA G98 GPU Chip encased in Lucite with lasered NVIDIA logo on top of the chip. This GPU was manufactured by TSMC using 65nm technology. The G98 GPU introduced in June 2008 would have been used in the 9300 GE/GS series of Video Cards from NVIDIA . 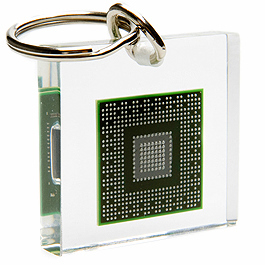 Since the chip found it's way into a keychain it is typically a rejected, flawed or under-performing unit that was not suitable for sale to a customer. The NVIDIA G98 GPU offered an improved memory controller to compete with their biggest competitor's latest chip, the ATI technologies RV670 GPU. 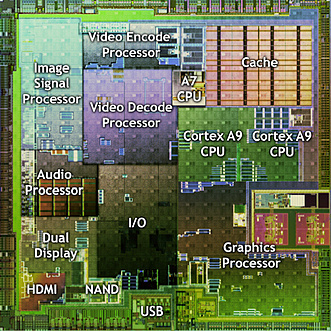 The G98 chip had 16 shader processors and it operated at 450 MHz. 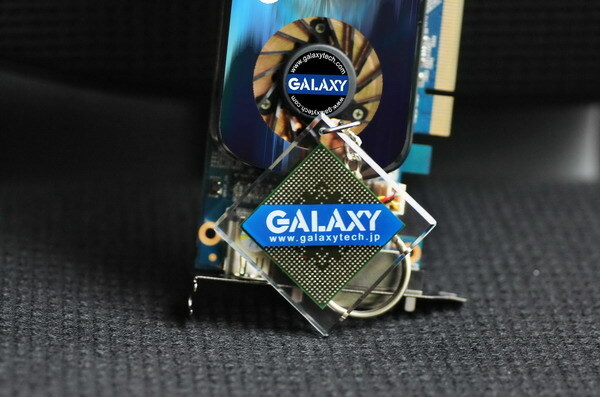 Courtesy of GALAXY Microsystems Ltd.
Galaxy, a maker of video cards using NVIDIA GPU's offered it's own version of the NVIDIA keychain in 2009. 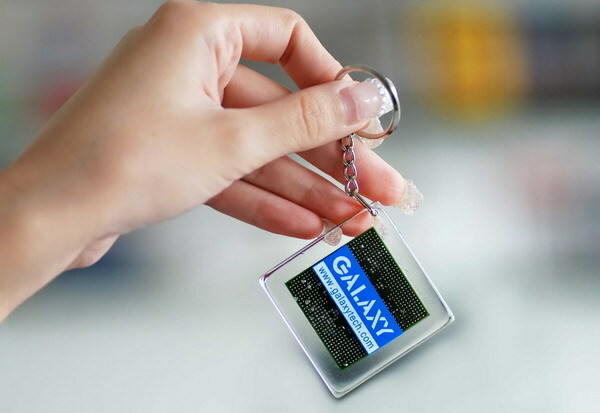 The keychain featured a different chip however, the NVIDIA G94 GPU, and was awarded as a prize at Galaxy promotional events. It not offered for sale to the public like NVIDIA 's keychains were. Clear Lucite, measures 1.5" square. 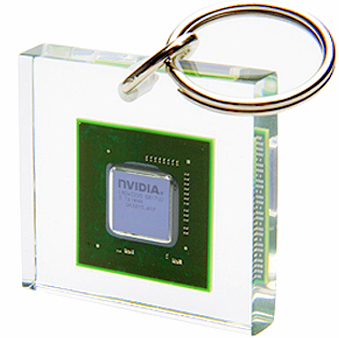 ​This is an NVIDIA keychain given out as a promotion to attendees at the 2010 CES Consumer Electronics Show. 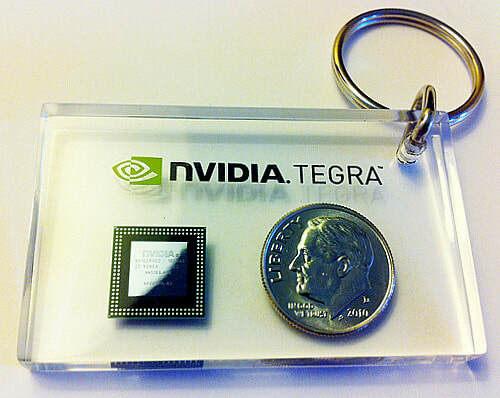 ﻿This is an NVIDIA keychain that contains an NVIDIA Tegra 2 Mobile SoC (system on a chip) embedded in Lucite. The NVIDIA Tegra 2 processor (AP20H) powered mobile devices including Android smartphones and tablets and competed directly with the Apple A4 SoC chip. 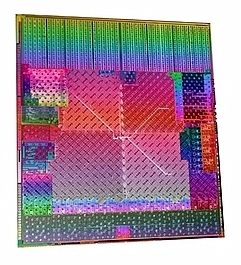 The 1 GHz Tegra 2 SoC chip integrated both CPU (ARM Dual Cortex-A9 processors w/ 1 MB of on-die L2 cache), RAM (1GB) & GPU (ULP GeForce - 8 cores) onto a single silicon chip and was manufactured by TSMC using their 40 nm semiconductor technology. This BGA (Ball Grid Array) Packaged Chip is marked with part # AP20H-PH-A4. Keychain reads "NVIDIA Driving Innovation". New, unused, Measures 1.5" square. 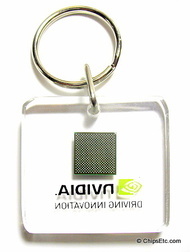 ​This is an NVIDIA PCB design ruler used by employees, and also given out as a promotional item, or gift. Offered at the Nvidia employee store.